The Wassertec Indigo ozone generator is a self contained system which can produce up to 20 grams/hour of ozone at the turn of a switch. Indigo features a built-in oxygen concentrator and optional oil-less compressor allowing the unit to produce ozone at high concentrations. Indigo has been designed for continuous operation in commercial applications with minimal maintenance. All components are of high quality and chosen for their durability and resistance to ozone. Furthermore all components are fully serviceable and easy to access. A versatile design allows for easy customisation and adaption to different applications and environments. A robust powder coated or optional stainless steel enclosure protects internal components from demanding environments. 1. 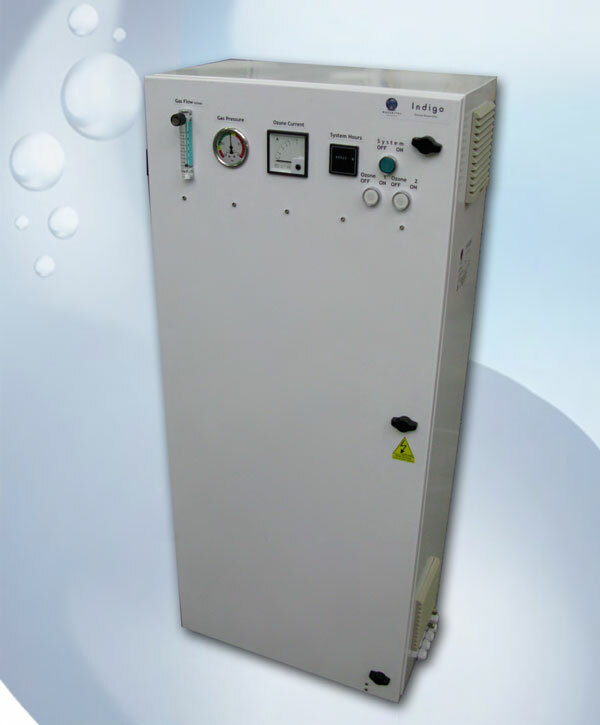 Wassertec Oxygen Generator – After many years of using imported oxygen generators Wassertec have designed and manufactured their own version. This unit is more robust and easier to service than its counterparts. 2. 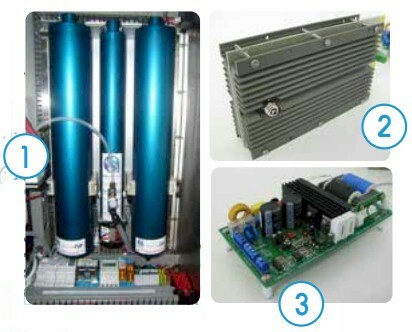 High Quality Ozone Modules – The ozone modules each produce 10 gr/hr of ozone from oxygen. They are constructed from hard anodised aluminium, stainless steel & ceramic. They are of a planar as opposed to tubular design which maximises air cooling efficiency and therefore ozone output. 3. Volume to be treated. Potable water treatment – Ozone is a very powerful disinfectant. At a dosage of 2mg/litre the Indigo can treat up to 10,000 litres/hour of water. Car wash water re-cycling – Increasingly automated car washes are making use of re-cycling systems in order to save water. Ozone is used in these systems to prevent unpleasant odours developing in the water as well as to reduce foaming. Fire restoration The odour left over after a re or smoke damage can be completely removed using ozone. The Indigo can de-odourise a standard sized family home & contents in 1-3 days depending on the level of contamination. Barrel or Tank disinfection Ozone when sufficiently dosed is highly effective as a surface sanitiser. Wooden barrels can be labelled with ozonated water to disinfect and remove volatile acidity causing bacteria. Steel tanks can be sprayed.